I am busy this week! Artem and I are headed out on a road trip on July 4, and I’m scrambling to prep Paleo camping food before we leave. I will likely end up making some compromises with my diet while I’m out, but I’m okay with that for a few weeks. It’s vacation. However, I don’t want to be eating junk for EVERY meal, every day. And I know that sticking with vegetables and protein will give me fuel for backpacking and kayaking. We’ll be backpacking for 3 days in Glacier National Park, then we’ll continue on to San Juan Island in Washington for some sea kayaking. I don’t have a ton of kayaking experience, but I AM thanking my former self for starting CrossFit back in February. My upper body strength, which used to be incapable of lifting anything heavier than a baby, has definitely improved (now I can lift small children!). I think I can now look forward to kayaking without my weak little girl arms falling off. 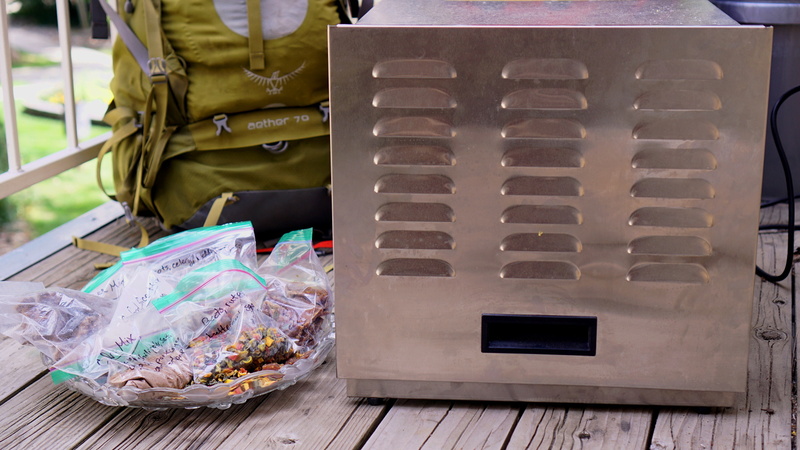 If you’ve made my beef jerky, you know how swanky and cool food dehydrators are. I got one because I was tired of making dietary compromises every time I went camping. Your options are either too heavy, expensive or nonexistent if you’re Paleo and shopping for backpacking food. Therefore, it’s simpler and cheaper to eat soy protein bars and grains. Sigh. 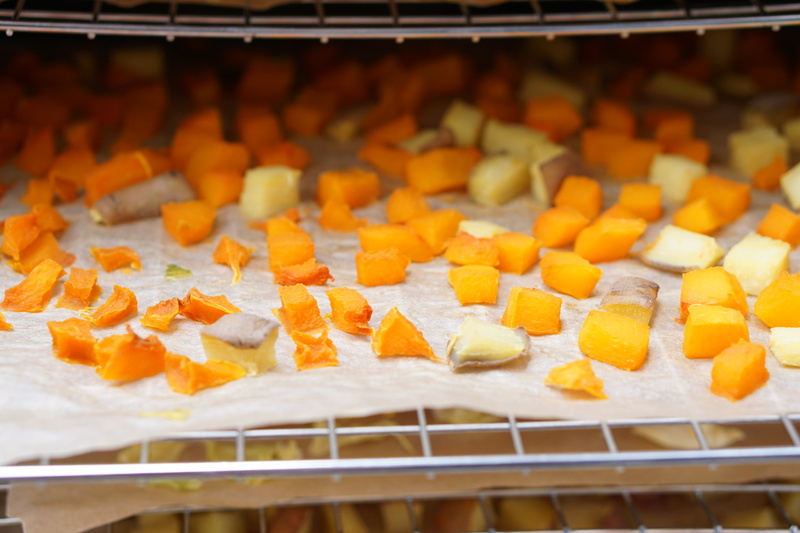 The idea with the dehydrator was to make my own Paleo-friendly backpacking meals. But honestly, I haven’t used it for much more than beef jerky and nut mixes so far. 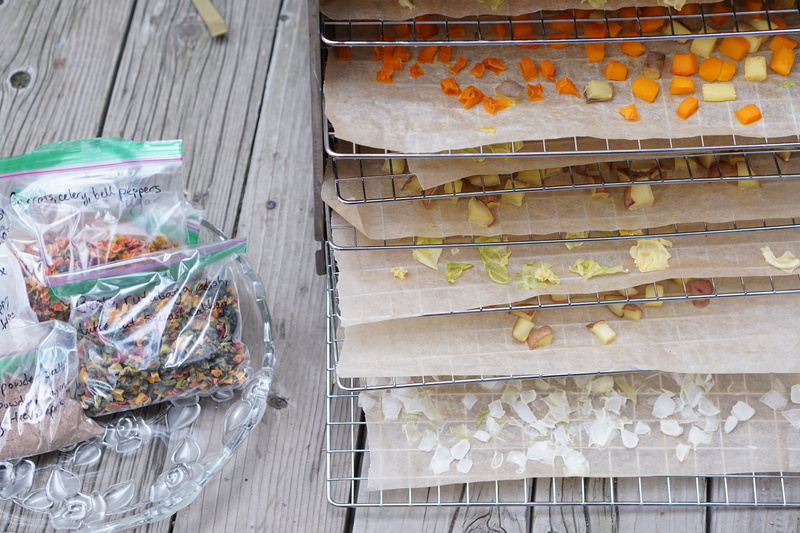 I just finished dehydrating 4 bags of diced veggies. I’ve made a pound of jerky; soaked and dehydrated pecans, walnuts and almonds; made my own spice and chili mixes; and dehydrated 2 pounds of ground beef and turkey (scored for easy portioning and storage). I’ve shopped for a few snacks, but this is the dehydrator’s moment to shine. If you’re going camping or backpacking soon and want to bring along some healthy food, I hope the following ideas will help! 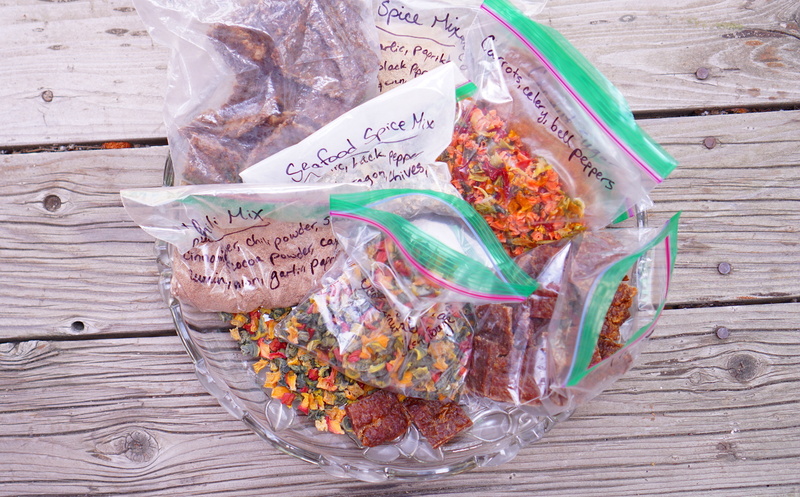 DIY soup and chili mixes: comprised of vegetables, meat and spices in Ziploc bags. Just add boiling water to make insta-soup–and spare your back the misery of lugging a bunch of fresh food up a 7-mile trail. I made a triple batch of the spices in my beanless chocolate chili recipe and stored it in a Ziploc bag. The only thing missing is fat, so I’d take along a couple tablespoons of olive oil in a leakproof container (I chose olive oil because any saturated fat might harden up too much in cold weather). Make your own trail mix: Whole Foods knows you mix ‘n match ‘n sample all the trail mixes in the bulk aisle, so don’t even try to pretend like you don’t. Besides, chances are, all of those mixes contain at least one item you’d rather not have. Get a bunch of single items in bulk and then mix up your own. My favorite mix consists of pecans, walnuts, almonds, tart cherries, blueberries and currants. Hint: Costco is your friend. Bring the skewers: dehydrated food is pretty useless/impossible on a stick, but for those days when you have fresh food on hand, skewers are an amazing and easy camping food. Change up the items you skewer and you have an entirely different meal, every time. Breakfast: Hardboiled eggs. Leftover soup from the night before. Tea. Maybe some fruit for quick sugar. Snacks: High protein and some fat is the name of the game here. Granola bars are really not going to sustain you as long as canned fish, Epic bars, hardboiled eggs and avocados. I do keep some high-carb trail snacks on hand, such as tigernuts and plantain chips. However, I know that if I’m feeling hangry, I’m better off getting some protein in my system. Dessert: I like to keep it simple with sauteed bananas or fresh summer fruit (tis the season, after all). A small amount of dried fruit is also an option. Chocolate, unfortunately, tends to melt or get gross and soggy in a cooler, and baked goods don’t stay good for long. I’ll post an update when I get back regarding how the dehydrated fare served me. Fingers crossed it’ll be good.